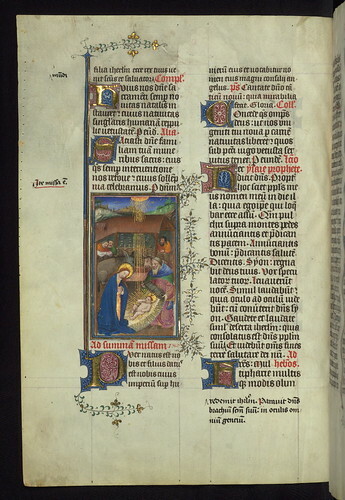 Missal of Eberhard von Greiffenklau, Nativity, Walters Manuscript W.174, fol. 17v, originally uploaded by Walters Art Museum Illuminated Manuscripts. The Missal of Eberhard von Greiffenklau is a masterpiece of Dutch manuscript painting. It was originally produced in the second quarter of the fifteenth century for von Greiffenklau, prebendary of Utrecht from 1446. The manuscript features work by the Masters of Zweder van Culemborg, active in the Utrecht area between 1420 and 1440, so-named after the Bishop of Utrecht 1425-33 for whom they produced a magnificent Missal in the late 1420s (now Bressanone, Bibl. del Seminario Maggiore). This Missal also features work by the celebrated Master of Catherine of Cleves, linking it to possibly the finest Dutch illuminated manuscript ever made; the Hours of Catherine of Cleves of c.1440 (Morgan Library & Museum, M.917 & M.945). This extremely elaborate Missal is illuminated with one full-page miniature, 52 column miniatures and 68 historiated initials throughout the manuscript, with the Temporal and Sanctoral sections being particularly richly decorated. In the late 15th century, a selection of prayers and sequences were added to the end of the manuscript in Germany, probably Mainz, and the volume was subsequently rebound with its current brown calf over boards, blind, rebacked binding either at that time or in the early 16th century.